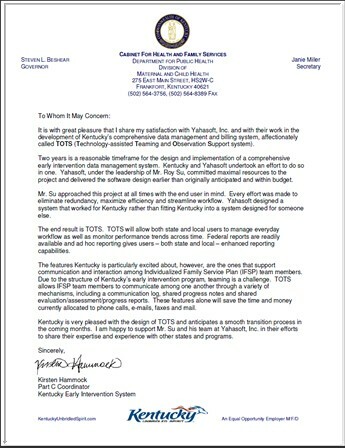 It is with great pleasure that I share my satisfaction with Yahasoft, Inc. and with their work in the development of Kentucky’s comprehensive data management and billing system, affectionately called TOTS (Technology-assisted Teaming and Observation Support system). Two years is a reasonable timeframe for the design and implementation of a comprehensive early intervention data management system. Kentucky and Yahasoft undertook an effort to do so in one. Yahasoft, under the leadership of Mr. Roy Su, committed maximal resources to the project and delivered the software design earlier than originally anticipated and within budget. Mr. Su approached this project at all times with the end user in mind. Every effort was made to eliminate redundancy, maximize efficiency and streamline workflow. Yahasoft designed a system that worked for Kentucky rather than fitting Kentucky into a system designed for someone else. The end result is TOTS. TOTS will allow both state and local users to manage everyday workflow as well as monitor performance trends across time. Federal reports are readily available and ad hoc reporting gives users – both state and local – enhanced reporting capabilities. The features Kentucky is particularly excited about, however, are the ones that support communication and interaction among Individualized Family Service Plan (IFSP) team members. Due to the structure of Kentucky’s early intervention program, teaming is a challenge. TOTS allows IFSP team members to communicate among one another through a variety of mechanisms, including a communication log, shared progress notes and shared evaluation/assessment/progress reports. These features alone will save the time and money currently allocated to phone calls, e-mails, faxes and mail. Kentucky is very pleased with the design of TOTS and anticipates a smooth transition process in the coming months. I am happy to support Mr. Su and his team at Yahasoft, Inc. in their efforts to share their expertise and experience with other states and programs. Basically TEIDS allows Tennessee to develop a cohesive system of general supervision. Our focused on site monitoring activities and survey activities are now linked with TEIDS. We use the information and reporting from TEIDS to do a risk assessment of Agencies/Districts/Counties. We then are able to target (in a real time approach) the actual compliance areas and non compliant areas. In the old processes with our old monitoring efforts with our outdated data system, we often monitored all programs in an in depth manner with little help from our data system in identifying the SPP compliance issues. In general before TEIDS, Tennessee spent many dollars and man hours at the state and local level to find problems. We however, spent so much time problem finding we left little time or resources to solving these problems. TEIDS provides a life source of information related to SPP compliance issues. We know the instances and details related to SPP Indicator Non- compliance at the State, Regional, District, County, Agency and even staff member level. Our ability to identify the problem and the Actual point of accountability allow us to concentrate the rest of our efforts on assuring the correction on non-compliance. This is a huge shift, in the past we were never able to focus our resources on correction, and we quite simply showed the same issues over and over and over again. This outdated system of data collection, monitoring and general supervision is no longer acceptable to Tennessee's leadership. More importantly with the letter of determinations being sent to states, it is no longer acceptable from OSEP's perspective as well. TEIDS positions us to correct our areas that Need Intervention. Without TEIDS, Tennessee would be facing continued federal scrutiny and possible enforcement action. We welcome your states learning more about how Yahasoft inc. can assist your state in addressing SPP reporting and compliance issues. None of the successes of Tennessee Early Intervention Data System (TEIDS) would have been realized were it not for the intensive support and time spent by our Yahasoft Project Manager, Roy Su. His commitment to learn the inner workings of IDEA Part C have been unmatched. Our project manager on his own dollars, attended the OSEP Accountability Conference in Denver. He did so not in the typical manner as a vendor, looking to give out free pens and strum up more business. He attended and participated as a conference attendee. He was able to hear the real struggles that Part C state are going through related to Indicator #1 (Timely Delivery of Services), or with the new data and reporting issues related to child and family outcomes. With Yahasoft, Tennessee is not a number; our needs are a priority not just for us but for Yahasoft. The response and resolution time for significant new needs from TEIDS continue to impress even the most skilled data specialists. Clearly Yahasoft took time to learn the intricacies of early intervention, but more importantly they took time to understand Tennessee. Many companies have IFSP writing tools that are off the shelf products that seem to work. However, the need for Tennessee was clear that we had to address SPP and federal reporting issues like other states, yet we knew that Tennessee (like your state) has many unique state management issues or concerns. 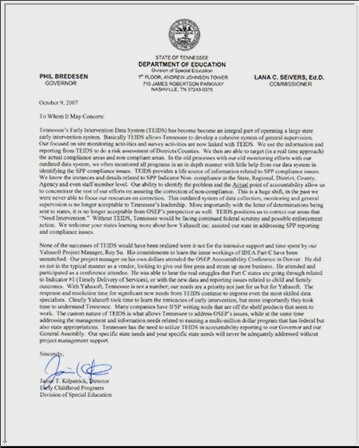 The custom nature of TEIDS is what allows Tennessee to address OSEP's issues, while at the same time addressing the management and information needs related to running a multi-million dollar program that has federal but also state appropriations. Tennessee has the need to utilize TEIDS in accountability reporting to our Governor and our General Assembly. Our specific state needs and your specific state needs will never be adequately addresses by using a product that was initially built for another state. We at the South Central District of Tennessee's Early Intervention System (TEIS) have been the pilot district for the project known as Tennessee's Early Intervention Data System, better known as TEIDS. I have been asked to give my overall opinion of the program itself and the support received from the development team. With great pleasure I would like to begin by saying that of all the projects I have ever been involved with, on the ground floor and up, this one has been one of the better transitions from one system to another. In the first section of my report I have included some comments from our office that were compiled during the first phase of the implementation of the new system. These comments in their written form were presented at an off site training session for district users. In an effort to inform other districts of the effectiveness and efficiency of the TEIDS system I have compiled some responses from our pilot user group. It has indeed been a privilege to be able to work with the TEIDS technicians and be on the ground floor of such a project as this. I believe I can say with confidence that the user group, although feeling overwhelmed and getting a rocky start in the beginning, feel the project is well worth the effort and will be a successful tool in data management for the future of TEIS. The referral and other letters are useful and I like having them right where I can get to them. I like how Planned Services is very specific. The demographics page is easy to fill in. It is nice how all the information is automatically transferred to the IFSP. I like how it is a web based program and I can use it from wherever I am at the time, to look up information or input information. We have felt as the pilot district that most of our requests for additions and fixes have been addressed by the TEIDS development group. We have been extremely pleased with the process by which we transfer our requests and how they have been satisfied through the updates to the system that we were receiving about once per month. There has been no request too small or too large that has not been addressed in some fashion through this development process. It is the makings of not only a very user friendly data tool but also a very user friendly system for the service coordinator. We believe that when this system roles out and we are using it alone for service coordination and for data collection it will be an exciting and beneficial tool for all users concerned. The second phase of the TEIDS pilot has included our service providers as users of the system. We have had outstanding participation and I believe a great eagerness has been shown to us by our service providers as they become acquainted with our new system. They enjoy the fact that it is web based and the fact that information is available to them online that previously had to be gathered from different sources, agencies, paperwork and phone calls. It is all right there at their fingertips. Many of our providers have expressed that typing their notes has been much more efficient in TEIDS than their former way of processing for their agencies. I personally have had more interaction with my providers since the implementation of TEIDS and I find that enjoyable and rewarding. Our third phase is the accounting program. We are currently in the process of using the TEIDS system for the purpose of billing and payments to our vendors for early intervention services. Again we are finding that Yahasoft is genuinely interested in making this a full service, self contained system that will meet not only TEIS's needs but also the needs of the other agencies that make our statewide program work. We are in constant touch with them and they are prompt, courteous and have made every effort to see that our software meets the requirements of our program and the needs of the users. This project has been a very positive experience. I believe that we received excellent support from the TEIDS development team .I highly recommend Yahasoft for any agency that might be considering a new system for data collection and/or reporting. Principal Investigator: Richard J. Lewis, Ed.D. Many strengths of TEIDS, including access to information (e.g., being able to see all the data from a supervisor's desk, being able to see all of a child's information across providers), integration of information across sources (e.g., across providers and agencies), and monitoring of timelines (i.e., reminders and documentation of achieved and missed timelines), were identified. Other perceived strengths, indeed other supporting evidence for all of these findings, are available from the Evaluator. A point of entry administrator said, Computer access to all children's data from my desk is great. I no longer have to go to files for information. A similar advantage was seen at the state level too. As a State administrator said, Access to real-time data from the office for all nine districts and the ability to pull specific reports when a request is made. We will no longer be dependent on districts submitting reports when a request is made. At the hypothesis generation stage of the analysis, it seemed that the examples provided in the finding were the major strengths, but so many other strengths were mentioned that this more general finding was more accurate. Users have identified positive impacts TEIDS has had on their professional lives, such as better access to information, more accountability, and prompts for deadlines. One point of entry administrator was more optimistic than positive: At this point, I'm still working in both systems, so TEIDS has duplicated my work. However, once we make the transition I think my work will be more accurate and more efficient. Another user said, Better able to meet guidelines for children's services without having to wait for information and reports from others. Originally, it was hypothesized that people had not had enough experience with TEIDS to know the impact it had had on their professional lives, but the data disconfirmed this: People did know.